When I was a kid I really hated breakfast. Mostly, it was eggs that I disliked. Especially, when my dad added cheese to the omelets. Oh! The smell! The combination of the cooked eggs and the melted sharp cheddar cheese...the smell alone had me feeling queasy for hours! Dad would make me some plain scrambled eggs and I would have to drown them in ketchup to cover the taste! In my early teens, I would hear my dad getting breakfast ready while listening to Breakfast with the Beatles. I started to pretend to sleep-in on those mornings, hoping he would forget to make something for me. Sometimes it worked, sometimes it didn't. The only time I enjoyed breakfast as a kid is when my dad would cook bacon, fried potatoes and scrambled eggs all mixed together. 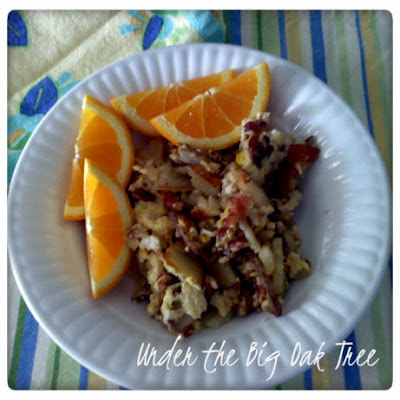 The bacon and potato flavors were strong enough to mask the flavor of those dreaded eggs! If only my dad could have made that every weekend, it would have saved us some ketchup! Not to mention, I could have spent less time hiding in my room on Sunday mornings. Over the years, I've made this several times. Canned, sliced potatoes work great, but I find it's easier to use leftover Grilled Potatoes to make this dish! One morning, I found myself with a half pound of pre-cooked bacon and leftover Grilled Potatoes in the fridge and knew right away that I was going to make this one-frying pan breakfast! Heat bacon grease in a large frying pan or cast iron skillet. Add in the potatoes in a single layer, stirring occasionally. Crack 6 eggs into a bowl and scramble with a fork. Add a splash of water and mix well. Pour eggs over potato/bacon mixture, stirring and scraping eggs from sides until eggs are cooked through. Canned potatoes work too, but take a bit longer to fry. If you don't have pre-cooked bacon, cook your bacon first. Drain the grease, leaving a small amount in the pan to use for frying the potatoes. This can also be made in more of an omelet form than a scrambled dish. My dad sometimes makes it that way, I just never have any luck with that method. This is great topped with ketchup, barbecue sauce or even some Tabasco Sauce! This works well as a breakfast burrito filling, too!